16 corporate teams, 17 Dulwich Prep pupils, partnered by their Fathers, 15 Dulwich Lady members and 6 Prep Old Boys played golf in wind and rain but high spirits to raise £10,320 (beating the previous record by £3,000!) for the Sparrow Schools’ Foundation. Prizes were won by the top four teams of four and the winners were Geoff Johnson’s team. Thanks go to Dulwich & Sydenham Hill Golf Club for hosting the day and to the many volunteers who helped to make the day a success. Next year’s golf day takes place on Thursday 17th May teeing off at 12 noon. Once again Dulwich & Sydenham Hill Golf Club will host the day and if you would like to play either as an individual or with a team please email the organiser Richard Bernhard: R.Bernhard@dulwichpreplondon.org. You will be most welcome! Kagiso Magano, George Marsh (Founder of Sparrow School Foundation), Ann Marsh, Norval Petersen. The eleventh fundraising event ‘Celebration of Christmas’ in aid of Sparrow Schools, took place on Thursday 8th December 2016 at the Royal Hospital Chelsea. 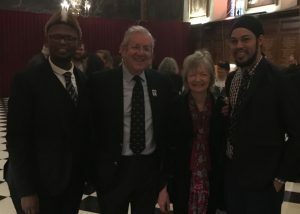 The carol service was attended by special guests including John McCarthy, CBE, Journalist and Radio 4 presenter, Paddy O’Connell, presenter of Radio 4’s ‘Sunday Favourtie’ Broadcasting House and David Robb, also known as Dr Clarkson in ITV’s Downton Abbey. Two teachers from Sparrow Schools, South Africa also attended the event. Norval Petersen, Science teacher at Sparrow Combined School and Kagiso Magano, English teacher at Sparrow Foundation School were selected for the first Teacher Exchange Programme between Sparrow Schools and Dulwich Prep College. The teachers read a letter from the Rays of Hope Children’s home, which recently sent ten pupils from the poorer township of Alexandra to Sparrow. The letter demonstrated to the audience how their donations are enabling Sparrow Schools to change the lives of disadvantaged children in Johannesburg. All the profit from the evening went towards developing Sparrow Combined School’s Science laboratory revamp. The South African youth’s mathematical and science competency is one of the major developmental issues that Sparrow is trying to tackle, with only limited resources available. If you would like to support children with learning difficulties from disadvantaged backgrounds, you can make a donation to the Trust, sign up to Sparrow’s ‘Educate A Child’ Programme or join the Bursary Scheme. £750 for three years will fund a bursary for a selected pupil at Sparrow. These bursaries are for young people who cannot pay basic school fees and receive no support from family members, government or other charities. Please contact lizzie@sparrowschools.co.za for further information. 100 golfers played for the Sparrow Schools Foundation on its thirteenth annual golf day; the sun shone brightly and it was warm all day. In the morning 20 Dulwich Lady Members played a competition, donating £400 to Sparrow in the process. 10 corporate teams of 3 teed off between 12 and 1.20 p.m. “Los Lobos” won the competition with “St. James’s Place Wealth Management” close behind. At 3 p.m. 6 Dulwich Prep Old Boys competed for the prestigious Michael Stimson Cup, which was retained by Richard West who left the Prep in 1988. 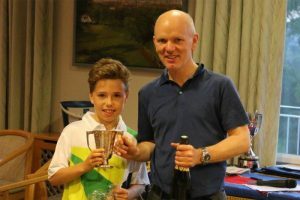 Between 3.50 p.m. and 4.20 p.m. 21 pairs of Dulwich Prep boys and their parents plus four members of staff played in either the 18 or 12 hole competition. 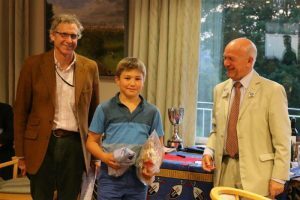 The Prep’s Big Band entertained the players superbly in the Clubhouse after competitors had finished their rounds and before Chris Chandler, Chairman of the Sparrow Trustees, presented the prizes. Adam and William Freeman won the 12 hole competition and Angus and Jimmy Shepherd won the 18 hole competition and, with it, the Sparrow Trophy. Thanks to the generosity of our sponsors who provided logo’d golf balls and paid for the food and Dulwich & Sydenham Hill Golf Club, who allow us to play their beautiful course in tip top condition free of charge, £7,000 will be sent out to Sparrow Schools. 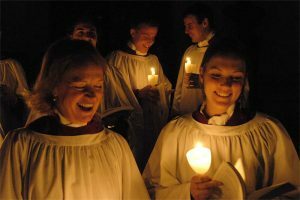 In 2006, Sparrow Schools Foundation began its Celebration of Christmas, held in the magnificent candlelit Chapel of the Royal Hospital Chelsea, built by Sir Christopher Wren and the home of London’s much-loved Chelsea Pensioners. The occasion is memorable for the beautiful and eclectic music provided by the superb Royal Hospital Choir and, in almost every year, the young boys from Dulwich Prep London playing their Millennium Handbells, a performance which brings tears to many eyes. Supporters old and new tell us that, for them, the Celebration of Christmas marks the beginning of Christmas and a Reception held in the Great Hall afterwards enables friends to meet and renew their relationship with the Sparrow family. It enables them, too, to see many of the young people who have volunteered in South Africa continue their association with us by helping to serve the delicious food provided by London’s top private caterers at a price that ensures that as much money as possible can be sent out to Sparrow Schools after the event. Over the past nine years, readers at the Celebration of Christmas have included our patrons, ambassadors, volunteers, educational supporters and household names from the worlds of current affairs, broadcasting, sport, food and the arts. A list of our readers from 2006 appears below but all share the bond of love, respect and admiration for what Jackie Gallagher and her colleagues have achieved for thousands of young South Africans over the past quarter of a century.